The central purpose of the Liberty Parade is to create a large scale parade through the heart of Minneapolis that is a CELEBRATION of shared values (liberty, freedom, justice, equality, free speech) rather than a partisan protest. 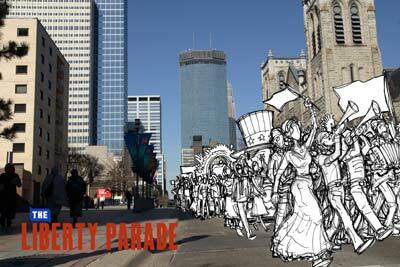 The parade will culminate in a large gathering featuring music, speakers, art displays and activities. Participants will be answering the question “ what does liberty mean to you?” in the form of a float, group march, or another sort of mobile visual representation that suits their artistic needs. Happening on August 31st, the approved route for the Liberty Parade runs through Nicollet Mall in Downtown Minneapolis, ending in Loring Park, just across the street from the Walker. The parade is accepting applications for floats and groups that want to march.